Someone just asked me a question on C# Corner - What is the difference between ASP.NET and ASP.NET Core, and what should I choose to build my next Web application? Another question, I saw was: Should I choose ASP.NET Core over ASP.NET in my next project? This article talks about some of the pros and cons that might help you make a decision between ASP.NET and ASP.NET Core. Let’s review the following .NET Architecture diagram. As you can see from the above diagram, the .NET ecosystem has three major high-level components: .NET Framework, .NET Core, and Xamarin. I personally feel the Xamarin part should fall under .NET Core which might just happen in the near future. The .NET Framework is used to develop Windows applications using WPF and Windows Forms and Web applications, using ASP.NET MVC. .NET Core supports UWP and ASP.NET Core libraries. UWP is used to build Windows 10 targeted apps and ASP.NET Core is used to build Web apps for Windows, Linux, and Mac operating systems. 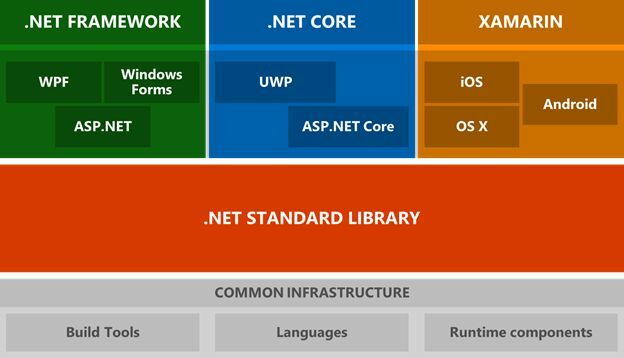 ASP.NET Core is one of the key components of .NET Core to build Web applications, using ASP.NET. "Both frameworks will still be supported in at least 4 years. Both frameworks have an MVC approach to coding and both use a very similar Razor templating language." Share components across various platforms – Web server, Mac, iOS, Android, XBox, Windows Mobile, Windows desktop, Unity .NET Standard with either. For professional developers, if you’re building a new website and you have to make a choice today, here are some scenarios. Want to target your Web app on Windows, Linux, and Mac operating systems. Are not afraid of breaking and fixing things since ASP.NET Core is not fully matured yet. Don’t need a cross-platform support for your Web app. Already have an existing team with ASP.NET expertise. For students, if you’re just learning and have no plans to join a company for the next year or so, ASP.NET Core is a better choice for you. It will give you more options to choose from in the near future. The following document lists the process and tools of migrating your existing ASP.NET MVC project to ASP.NET Core.